An excellent, in-depth walkthrough of both what service workers are, and how to implement one of your own, from scratch. The MediaRecorder API enables you to record audio and video from the Web. It’s available now in Firefox and in Chrome for Android and desktop. A page that uses all but a handful of HTML5’s elements. Useful for testing and seeing differences between browser implementations. Have an Outdated or Obscure Stack? 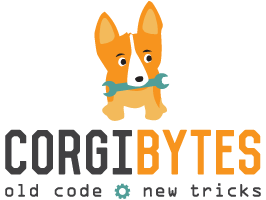 Let the super-polyglots at Corgibytes help. We code in any language, platform, and framework. CSS variables (a.k.a. CSS custom properties) are landing in Chrome 49. They can be useful for reducing repetition in CSS, and for runtime effects like theme switching and even polyfilling future CSS features. jCanvas is aimed at jQuery users and provides a jQuery-style approach to working with the HTML5 Canvas. The new font-display descriptor for @font-face lets developers decide how their web fonts will render (or fallback) depending on how long it takes for them to load. A modern WebGL engine that includes physics and post effects. A look at how scrolling is getting smoother in Chrome 49 and some of the issues involved. Responsive, lightweight, fast, synchronized with CSS animations, fully-customizable modal window plugin with declarative configuration and hash tracking.